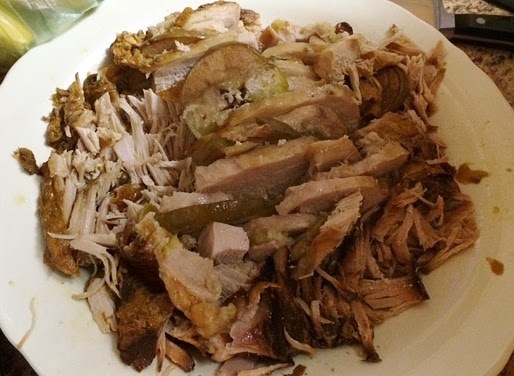 Living in southern Iowa, we're so spoiled by the quality and variety of pork we can get here. The grocery stores have some really great sales, too, making amazing cuts of meats a good deal. Recently I got a 10-pound pork tenderloin at less than half price. I brought it home, cut it in half and froze one piece. The other half went straight into the slow cooker! Three other ingredients and we had meals for several days. Cut several slits in the fat side of the tenderloin. Slice an apple and slide one slice into each slit. Heavily sprinkle the whole loin with brown sugar. Cook on low for 8-9 hours. You don't need any liquids because it will create its own juices. 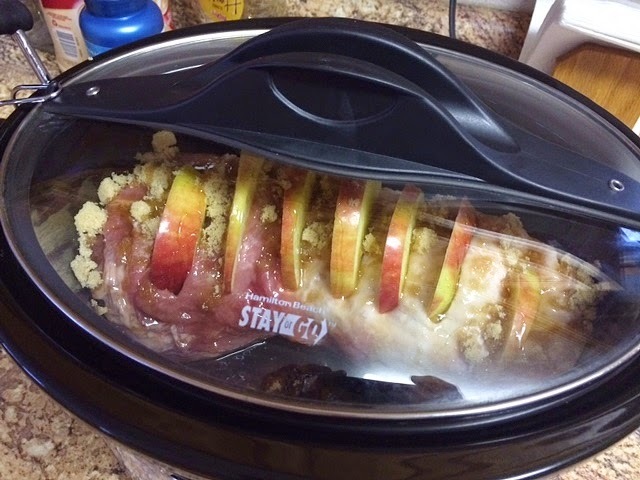 The apple slices will caramelize and melt down into the tenderloin, making it all sweet and tender. Take it out and shred the meat. Serve with a side of veggies and some fruit.